Skeletal and dental fluorosis affected people due to increasing of fluoride content in bore well water in parts of Arsikere taluk. ARSIKERE: Coconut growers in Arsikere are unhappy as they were hit by price crash and drastic fall in the yield due to consecutive droughts in the past three years. Many growers are least bothered about assembly elections as the state and the Centre have failed to announce a special package to save them from the distress. Statistics available with Express shows that over 9 lakh coconut palms were completely withered in Arsikere taluk due to successive droughts. The successive governments have completely failed to release any compensation to coconut growers, though they met many senior leaders of different political parties with pleas for help, alleged Marulasiddappa, a coconut grower of Doddametikurke. Small coconut growers, who has less than 80 palms, have abdandoned their farms as borewells failed to yield water in Doddametikurke, Deshani, JC Pura, Kanakatte and Banavara hoblis in the taluk. The Union and state governments are yet to take a decision on releasing compensation on the lines of Kerala where affected growers got Rs 7,000 per tree, Siddaiah, a small farmer, said. Local MLA K M Shivalinge Gowda along with coconut growers had staged a dharna on the outskirts of Arsikere town for five days to draw the attention of the state government four months ago. Horticulture Department sources said over 44 lakh coconut trees in 45 taluks of 13 districts have been withered in the last couple of years in the state. “The Union budget is anti-poor and there are no sops for the horticulture sector,” rued a coconut grower. People are anxious and many are affected with fluoroisis which is said to be another issue in the taluk. Nearly 45 villages, including Banavara, Handralu, Haranahalli, Bagivalu, Hiresadarahalli, Kallyadi, Karagunda, Kenkere and Nuggehalli of DM Kurke, Banavara and Haranahalli hoblis were affected by fluorosis. The fluoride content is above 2.5 PPM in the water in these villages and many have been suffering from dental and skeletal fluorosis. The ZP and the Health Department have jointly taken up steps to provide pure drinking water by setting up drinking water units in the many affected areas. 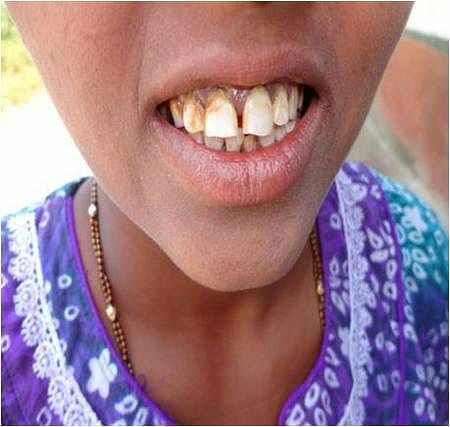 Siddamma suffering from dental fluorosis alleged that the government could have taken precautionary measures to prevent fluorosis. “The officials should provide enough pure drinking water for the affected villages. I am not aware of assembly elections,” she added. K M Shivalinge Gowda, a Vokkaliga, has been representing Lingayat-dominated Arsikere taluk for the past two times. Caste equations are playing a major role than other issues and problems in the constituency. The sitting MLA is popular among people as a series of development works have been taken up during his tenure, sources say.